Background: Isoxazoles, pyridazines, and pyrimidopyrazines have recently attracted attention due to their potent pharmacological activities. They exhibited anticancer, neuroprotective, analgesic and anti-inflammatory effects. Objective: The study aimed to synthesize novel isoxazoles, pyridazines, and pyrimidopyrazines through efficient high yield protocol for evaluating their analgesics and anti-inflammatory activities. Method: A series of novel isoxazole-, pyridazine-, pyrimidopyrazine derivatives was prepared from 5,8-alkyl-1,3-dimethyl-5,6-dihydropyrimido[5,6-e]pyrazine-2,4,7-trione (1a,b) as the starting material. Results: The prepared derivatives were synthesized in moderate to good yields (60-75%) in a stepwise efficient protocol under mild condition. These new compounds have been proven by several spectroscopic techniques as IR, 1D and 2D NMR techniques and mass analysis. 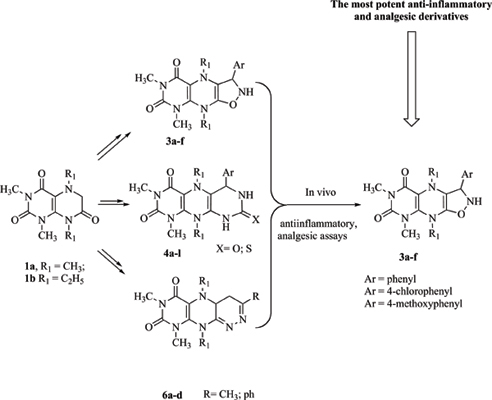 The in vivo anti-inflammatory was assessed for the synthesized compounds using carrageenan-induced rat hind paw edema model. Also, the in vivo analgesic activity for these products was examined utilizing hot-plate and acetic acid-induced writhing response assays. Conclusion: The isoxazole derivatives (3a-f) showed the most forceful anti-inflammatory and analgesic activities. Pyrimidopyrazines (4a-f) demonstrated weaker but comparable antiinflammatory and analgesic activities to the positive controls. Analgesic activity, anti-inflammatory, isoxazole, pyrazine, pyridazine, pyrimidine.